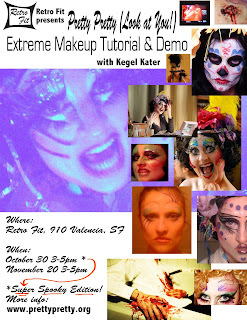 I'm super excited for Super Spooky Pretty Pretty today from 3-5pm @ Retro Fit 910 Valencia @20th. Glamour, zombie, and candy blood!Please note: it will be standing room only, because the store will likely be busy with last-minute Halloween shoppers! Get there early if you want a good view.